This post is the 17th post in the #21PostsInMay Challenge where I aim to publish a new post every single week day in the month of May. All other posts published in the month of May can be found here. Anyone who even loosely follows the food scene in Cambridge (or even Boston) will know Tony Maws. One of the select few chefs in Boston to have won the coveted James Beard Award for Outstanding Chef, Northeast (in 2011), Chef Maws owns both the more upscale Craigie on Main and the more casual Kirkland Tap & Trotter. Both have excellent food, and I checked out Kirkland soon after its opening, largely because I (along with the rest of the world) expected a lot out of Chef Maws. He did not disappoint, and I feel like Kirkland Tap & Trotter has only gotten better since our first visit in the early days of the restaurant. I must confess, however, that my first post about Kirkland Tap & Trotter had an obvious gaping hole that I can’t believe I have not filled until now. It didn’t have The Burger. Tony Maws’ burger, which he first introduced on the bar menu at Craigie, quickly attained a cult-like following and became so popular that Chef Maws had to limit the number of burgers sold a night (eighteen, to be exact). These easily sold out well before 6:30PM on most nights. One promising feature of Kirkland Tap & Trotter was that there would be a burger on that menu too. It wouldn’t exactly be the Craigie burger, but it would still be an expression of Chef Maws’ talent and passion. Better yet, it wouldn’t be nearly as limited. The Kirkland burger is available at dinner and weekend brunch. It’s already gained its own respect, winning Boston Magazine’s Best Burger in 2014. We’ve visited the restaurant twice for brunch now, and we love it. The prices are reasonable; there’s usually plenty of available seats; and the food is great. Of course, I would expect nothing less from Chef Maws. Here’s a look at some of the offerings, including (of course), the famous burger. In the two times that we have gone, the KT&T Burger ($16), has been a daily special. It’s a classic cheeseburger made with grass-fed beef, Emmenthaler (a type of Swiss cheese), kimchi-Russian dressing, and caramelized onions. On the side there’s kimchi ketchup and Kirkland fries. Add a fried egg and bacon for an additional $4 (highly recommended!). The grass-fed beef patty is made from a mix of chuck, fat, and suet from Savenor’s, the butcher just across the street. The secret to how they keep the burgers so moist is through the use of a CVap oven. CVap, which stands for “controlled vapor technology”, heats food in a humidity controlled environment at extremely precise temperatures – sort of like a cross between sous vide, a convention oven, and a steam oven. The resultant burger is extremely juicy and flavorful. Although there’s not a crunchy “crust” on the burger itself, the crispy bacon more than makes up for that. The rest of the ingredients – the runny egg, the crispy lettuce, and the soft bun – all come together beautifully to form a pretty awesome burger. Bryan is even willing to get his hands dirty to enjoy this burger. It’s not the Craigie Burger, but it’s still very good. Better yet, it’s always available. If you don’t feel like a burger, there are several other great options on the brunch menu. The menu’s not huge. There are seven entrees and seven sides plus a couple specials. Entrees (described below) range in price between $14-$17 while sides (e.g., kale salad, granola + yogurt, sausage links and the like) range from $2 to $10. There are some fun cocktails on the menu (mimosas, bloody Marys, and a couple more creative concoctions) as well as a handful of “morning beers” and “brunch wines”. The Turkish Breakfast ($15) is an excellent vegetarian option. It consists of a hearty eggplant and chickpea stew, grilled vegetables, and a fried egg. I really liked the Mediterranean flavors in the stew, and the grilled bok choy had a nice smoky char. It was nice to feel reasonably healthy after eating this dish. The Heuvos Rancheros ($14) start with a base of two deep fried corn shells which are topped with black beans, KT&T breakfast sausage, a grilled avocado, a runny egg, and red and green chili sauce. We both loved the house made sausage and were a bit sad that it was so small (it’s the curled up thing on the skewer that sort of looks like shrimp but is not). It made me want to order an extra one from the sides part of the menu. Overall the dish was delicious, and the red and green chili sauce brought everything together really nicely. The Mushroom & Reggiano Frittata ($16) is a simple mushroom frittata topped with a gorgeous spring salad (fava beans, ramps greens, and the like), oven-roasted tomatoes, and grilled focaccia. Although it’s simple, the mushroom frittata stood out to me because I loved the intense, earthy flavors from the wide variety of gourmet mushrooms. Everything was well seasoned and the flavors really shone. Best yet, there was hardly any cream or cheese, so the frittata really highlighted the mushrooms, which is really the way it should be. 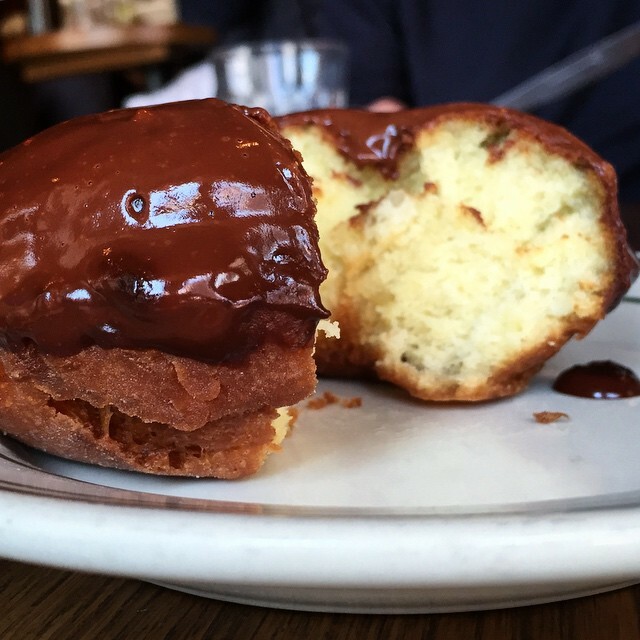 They will tempt you with a Housemade Donut ($4), which comes with their chocolate-Guinness glaze. The doughnut, which was freshly fried, was good, and I enjoyed the unique chocolate-Guinness glaze. Warning – it is pretty sweet. I ended up not finishing it because one bite was plenty. Bryan enjoyed his half of the doughnut with coffee, which helps a lot. We both really like coming to Kirkland Tap & Trotter, especially for brunch on a weekend. The food is excellent, the prices are reasonable, and it’s never jam packed during brunch (it’s pretty easy to get a table). I actually like how the portion sizes are not too crazy huge, so you can eat everything on your plate and still feel reasonably comfortable after the meal. All in all, Kirkland is very successful at being that approachable neighborhood restaurant with really good food and a focus on the community. The restaurant has various specials and events during weeknights to bring in customers from the neighborhood. There’s “Hot Dog Mondays”, “$2 Grilled Oyster Wednesdays”, and the aforementioned Burger and Beer Deal on Sundays. As summer approaches, the restaurant is featuring signature “Celebrity Chef Dogs”, where various chefs from around Boston feature their own take on the hot dog. Chef Maws is a pro at this and clearly knows what he’s doing. I just feel so lucky to live in the neighborhood.